A female scriptwriter works on a high profile WWII propaganda film. Both Hollywood and the UK film industry seem obsessed with World War II at the moment, with a host of war movies on the 2017 release calendar and beyond. That's good news for any actor who can pull off a half-convincing German accent, but bad news for women seeking substantial roles. Of course, though largely neglected on screen, British women played a huge role during WWII, keeping the home fires burning by essentially running the country while their husbands, brothers and sons were off fighting the Hun. This changed the social landscape of Britain forever, giving a long overdue boost to the role of women in society. After finally being given the chance to show they could fulfill jobs previously denied them, women weren't about to shuffle quietly back to the kitchen once hostilities ended. Fitting then that a woman director, Lone Scherfig, should deliver this look at the wartime propaganda film industry, exploring through its protagonist, Welsh screenwriter Catrin Cole (Gemma Arterton), the struggle of women to convince the old men left in charge of the country that they were equal to the tasks vacated by men. Known for writing women's dialogue - patronisingly referred to as 'the sop' - Catrin is hired by the Ministry of Propaganda to work alongside chauvinist screenwriter Tom Buckley (a largely unrecognisable Sam Claflin sporting a period pencil mustache) on a major production set during the evacuation of Dunkirk, one designed to boost the morale that had been somewhat lost by that major setback for the Allies. 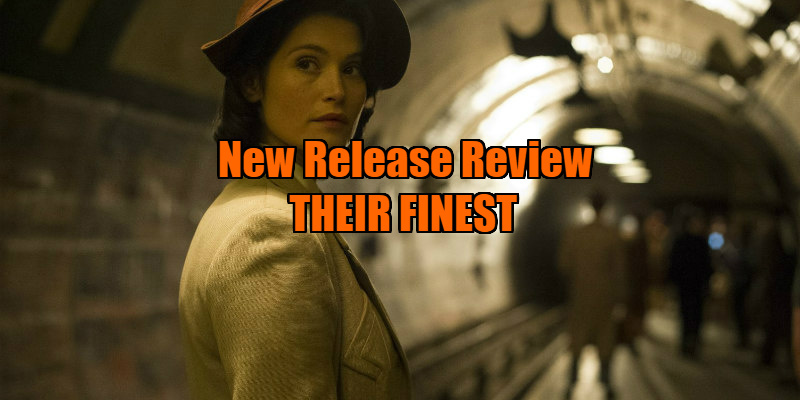 At its worst, Their Finest plays like a second-rate British imitation of Tim Burton's Ed Wood, with its tired gags about amateur actors embarrassing themselves in front of the camera. In this regard there's little we haven't seen before. The initial antagonistic relationship between Catrin and Tom predictably but unconvincingly gives way to a romantic subplot that feels strained and at odds with the movie's feminist undercurrent. Tom doesn't really have an arc, beginning the story as a sexist cad and ending it in much the same vein, so it's disappointing to see him rewarded with Catrin's affections. As is so often the case with British comedies, the standout here is Bill Nighy, playing an aging pretentious actor. It's a role we've seen many times before, but Nighy adds both a melancholy despair and crackerjack comic enunciation to the part. Elsewhere, in a one scene cameo as the Secretary of War, Jeremy Irons briefly lends a touch of class. Ironic then that it's two old men who steal a movie about young women attempting to receive recognition of their talents. 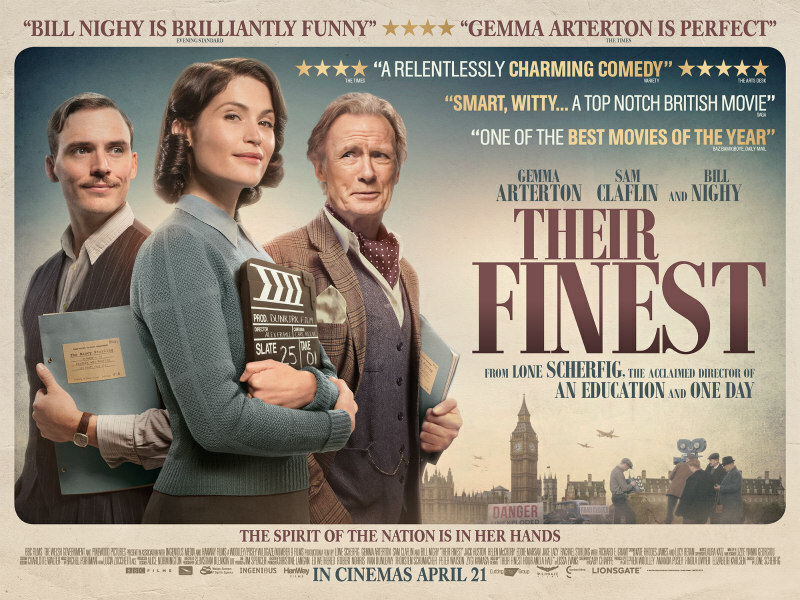 Their Finest is at its best when exploring the ghoulish reality of life in a city under constant attack from the air, and there are some remarkably dark moments - Catrin vomiting after discovering a woman's corpse among what she previously assumed was a pile of shop mannequins; a nurse confessing to accidentally stitching someone else's fingers onto the corpse of a man previously missing two digits; the shocking denouement of a major character - for a movie that on the surface appears the very definition of light entertainment. Yet while such moments are thought provoking and prescient, they jar uncomfortably with the general comic tone of Scherfig's film. As a backstage comedy, Their Finest has little new to offer, but as a historical drama it occasionally dares to explore the homefront horrors of war, underlining how important it is that the show must go on. Their Finest is in UK/ROI cinemas April 21st.